My wife and I are big fans of letting our kids try things, and then seeing how they play out. For example, over the years Austin has shown a variety of obsessions with things. When he was 3 the only thing he could talk about was wanting to be in hockey. Then the day that we signed him up he decided he hated the helmet (with the face mask) and promptly decided he didn't want to be a hockey player anymore. Luckily, we were able to return the $300 worth of gear we had purchased. In middle school he wanted to be on the football team. But after 2 years of repeatedly getting pummeled by kids twice his size he wisely decided that wasn't his game either. Following that he spent several years taking guitar lessons (which I thought he was getting pretty good at) until skateboarding entered his life and that was that. From that point forward his entire existence has revolved around nothing but the almighty skateboard. Now, his latest interest is spinning off into videography as a result of the "footy" he and his friends have been gathering while skating. I'll be posting a video of his latest project in a few days once he's finished with it. The same thing goes for my daughter. In the last several years she has tried viola, piano, skateboarding, soccer, baseball, and basketball. Some things she comes back to, others she has abandoned. It's all based on what floats her boat at the time. But her latest interest has been in karate of all things. After receiving a free 30-day trial membership in the mail, Roseanna decided she wanted to try it. To say she likes it would be an understatement. Classes are offered up to 4 times per week and students are encouraged to attend at least 1, and hopefully 2 times if they can make it. In the last 3 months since Roseanna has been signed up, she has been going 3 times/wk and sometimes 4, and still can't seem to get enough! Now, in addition to learning the basics, she has advanced far enough where she gets to don all the padded gear and engage in sparring as well. Not only is karate good for you physically, but it also builds self confidence and provides self defense skills that you can draw on if necessary. 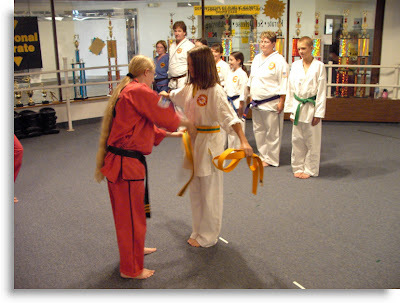 Here she is below receiving her latest promotion to gold/green belt. If she keeps attending at the rate she is right now, she will receive her black belt by high school. I think that would be awesome if she stuck to it and reached that goal. The point is, not everything your kids try will pan out. I used to get frustrated when Austin didn't practice his guitar because as a musician, I wanted him to experience the artistic release I feel when I am able to make music. But eventually I bit my tongue and just let him move on to other interests. Oh sure, we had to ask him to make a decision at some point. Because spending $20/wk on lessons that he wasn't taking advantage of didn't make sense for either of us. But in the end he found another passion which has taken him to new and exciting levels in his life. So I say let your kids try things. They might just find something they didn't even know they were looking for. I can't wait for my kids to start doing stuff like that. I'd love for them both to get into martial arts, and if not that, something else physical. And I'd love it if they got into music. Brad's learning to play the bagpipes so they've been going with him to bagpipe band and they LOVE it. Am I worse off for it today? 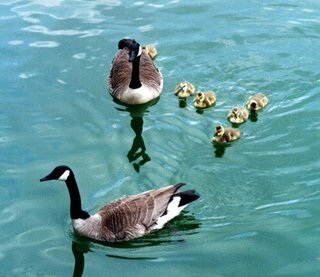 If I had kept swimming or kept up with my flute lessons, would I be in the Olympics or the National Symphony Orchestra? I'm thinking NO. But I do have lots of fond memories of all of those activities, and I'm glad I had the opportunity to try them. You're definitely a good parent to let your kids dabble in so many interests! Those are wise words. It makes sense not to force a kid to do something. That makes for a kid that lives in your basement until they are 36. That's great. All too often we parents choose the activities for our kids in an attempt to live vicariously through their youth. I love the karate thing. I hope my daughter picks something that cool when she's Roseanna's age. If I could only get my son to try things, this would work. He's resistant to so much. We push him to try things, though, and sometimes an interest develops. I'd like to see my son find his passion. So far he seems to have fallen in love with just reading, which is awesome, but I want him to be a bit more well-rounded. Close behind are photography, soccer, and movies. Emma keeps talking about she wants to learn how to ride horses. So we are looking into riding lessons, but most places start at age 5 and she is only 4. She of course had to choose an expensive hobby. But I think it fits in with her spoiled little girl persona. Going to a private preschool, taking horseback riding lessons...when she's 16 she'll be starring in that MTV show. I stick with most things I try. But I've stopped basketball, soccer, and the violin. I'm still in Ski Club. ((They tkae you skiing and you can either snowboard or ski. I ski. The terrian park is the bestest part!!)) And I still practice the clarinet. I've been playing the clarinet since 3rd grade. Also, I love singing, reading, and occassionally writing. I agree wholeheartedly. The only problem is now we're trying to balance theater, piano, tennis, and basketball. Bad enough for her, extra tough for the working mom. That is so true! You know I'm still trying things at my ripe old age. AND I found things that, not only do I enjoy doing, but I'm actually good at! I wish I had discovered some of these things when I was younger. marie - Believe it or not, they have martial arts for teeny tots too. They just work on a different advancement system than the teen/adults do. Our school has TONS of them. Besides VFW guys, I've never met another bagpiper. How cool is that? liberal banana - Variety IS the spice of life! sornie - Oh the horrors! Don't even joke about that. sandy - Like I told Marie, if she's interested now, it is available. But like you said... she needs to want to do it too. phil - I dream of my kids finding a love for reading. They did read all the Harry Potter books when they were younger, but not so much these days. regan - Good for you! Roseanna has been toying with the idea of joining the snowboard team too. And we're getting a new terrain park right here in St. Cloud this winter, so that should help her decide too. susan - I love that post you wrote. A great perspective on the parental challenge side of the coin. babs - I tried snowboarding for the first time a few years ago. I got pretty beat up the first few times, but eventually got to the point where I was enjoying it. Problem is, every winter I have to relearn how hard the ground it. Just being willing to give challenges a trial, makes a well rounded person. 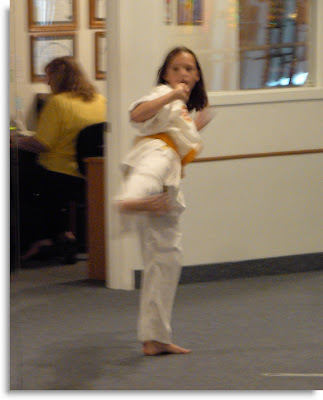 None of our kids took Karate when they were young...just about everything else, though. Thanks for stopping by my place today! I took one karate class when I was young. It was not for me. I also tried ballet, gymnastics, soccer, Girl Scouts, blah, blah, blah. My parents were supportive for me to at least try things once. My older daughter (have to differentiate now you know, lest you think I'm talking about my 3-month-old) LOVES swimming so we seem to have happened upon her passion early. K, I think, would like some sort of music lessons. He just started singing with the cherub choir at our church, but I think he'd like something like guitar too. But I don't know if he's old enough yet. I totally agree. I can't wait until we get our daughter and let her try dance and skiing and horseback riding and anything else whe wants! Good stuff Jeff. When he gets to that point, Rickey will definitely be encouraging his kids to try new things. ...as long as they're not too fickle. No one likes a quitter damnit. If one of Rickey's spawn takes up violin then gets tired and moves on to piano, then the flute, than learning mandarin, well, Rickey will be slightly less than pleased. I totally agree. I just require that it be within a 5 square mile driving area. willow - I think karate has become more popular recently. Right now there's about 10 different martial arts options in our little town alone. heather - Yes, you are in the prime "try it and see" stage. Sometimes the toughest part is limiting what they can try. michelle - I'm impressed. It takes a lot of guts to build a cheerleader pyramid - with skates on! elizabeth - I can't wait until you get your daughter either. You're getting closer though... hang in there! rickey - Mandarin or mandolin? One will help with the ability to communicate globally, the other with the ability to play Bruce Hornsby songs. meg - Even better... within walking or biking distance for the kids. I let my kids try whatever they wanted and I also let them stop if it wasn't a good fit. There is plenty of time once you're an adult to do stuff you would really rather not be doing. I am planning to take violin lessons if I can find a teacher in this town. Good for you and good for your kids. It's only by experimentation that they will find what's right for them. And we are all allowed to change our minds now and again, right? We quickly discovered that the elevator was NOT soundproof. These were the same kids that spun a revolving door until someone puked. And they once wore out their welcome on the elevators at Landmark Center. I sense a pattern... At least they're cheap to entertain. I couldn't agree with you more! We have to remember that their childhood is FOR trying things out. The greater their world is expanded, the more options they have as an adult. I'm so happy your daughter's enjoying karate. And I've already seen evidence of your son's brilliance as a videographer. It doesn't have to be about being a world champ or becoming a hot film director. The confidence they get from succeeding will take them anywhere they choose to go. Man...I hope its a platinum mine in the back yard!!!! I agree. It's so hard to know what will "take." Kids always see things they want to try. After they give up on a few, parents are inclined to just say no to everything, because they are sure they won't stick with it. This is not a good idea. My ex husband regretted that his parents let him quit taking piano lessons. But who wants to fight and fight with kids to get them to practice? The man took up lessons after he was thirty and it has become an important passion in his life. But that's not the story I want to tell. Our son was 11 when his dad decided to bring home a piano and start playing again. When dad sat down and played Fur Elise, Jake was mesmerized. (I had taught Jake the basic duets like "heart and soul," etc, but nothing serious. Number one, because I don't play piano! and number two, we didn't own a piano!) Anyway, Jake had loved playing the little ditties he knew, but now he desperately wanted to play THIS! His dad taught him to play the song, and Jake memorized it very quickly. He played it with such feeling that we were stunned. Our son was a prodigy and we didn't even know it! And never would have if his dad hadn't brought home that piano for himself! Jake went on to become a fantastic and amazing musician, even composing his own music. At recitals, I've seen women brought to tears at hearing him play Clair de Lune and Moonlight Sonata. Dan did TaiKwonDo all the way to his green belt (next is blue and then black). It was an excellent confidence builder and we even went to a few competitions. mom thumb - No kidding you did. If I remember correctly, Curtis became a pilot as a teen? Now that's what I call letting them try things! maureen - Yes, change is good. Have you been watching our campaign ads? gette - That's ok, Midtown Plaza doesn't care how noisy kids get. Did you get a chance to hear how loud that karate studio is? ve - No kidding. Look what happened to Jed Clampett! teri - What a great story about Jake. Thanks for sharing that. :-) The hockey gear was easily "worth" $300 but we've always tried to find used-a-bit sports equipment whenever possible. Hockey, football, karate... they're ALL expensive! windyridge - Cool. I even took it with my boys when they were younger. Well, when I was younger too. Oh the expenses of extra-curricular activities... Been there, done that - I mean doing that. Andy had baseball, then drum lessons, and videography. He still tries them all. Benjy has been our most athletic, so far with soccer mainly, but lately he's into gymnastics. The girls have had soccer and Irish dancing, and are now into gymnastics (thank you Olympics). Oh and softball. Danny is two - but still gets involved with gymnastics. All of them are very involved at church, and not because we make them, but because they want to do it. After saying all that, I really wanted to say that I agree with you there. I absolutely agree with you! Our two boys tried so many things I've lost count! Martial arts, guitar, piano, violin, drums, skateboard, rollerblading, swimming, diving, BMX, mini motorcycles, gymnastics, electronics, art, computers, photography, karting, model-making, etc etc etc. One is now a computer programmer who writes an online comic and makes unique models to order - he took to his home computer like a duck to water - the is other a sound technician, who composes his own music despite being unable to read it, having spent years playing with this and that. Eventually they find their niche .. but how are they to do that if they aren't allowed to try various things? Well, he did have a grandpa who was a pilot(with a simulator that he could use), and a dad and an uncle who were flight instructors, so it was quite a bit easier for him to get a pilot's license than it would be for most teens. Plus, he had access to Grandpa's plane. Not to diminish his accomplishment, he's a wonderful pilot. His dad mercifully waited until after he soloed to tell me. I find it hard to bite my lip with the piano lessons. They could let every other thing go but something in me just wants them to have the piano. Great advice Jeff but it's hard to bite my tongue when we already paid for the piano lessons in advance. So we nudge nudge Tyler to practice if that doesn't work a little bribe here and there did the trick, it's bad I know but we'd want him to try it out for a few years before giving up. Is that so bad? !